Things not pictured: Bumpits, Chicago souvenirs (pink Magnificent Mile mug and a ornament because I love Christmas ornaments! 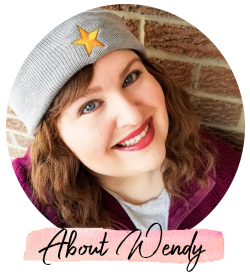 ), Wisconsin souvenirs (a backscratcher and a magnet), items that I will be reviewing later (such as Chi hair gift pack, Soap & Glory soap, Batiste dry shampoo), camera case, a belt from Torrid, black mini-bow hair pins from Torrid, random soda that I can't get here in Canada, and a few other little necessities that I can't get here. My first trip to an Ulta! I went in looking for a certain hair waver, which they did not have. 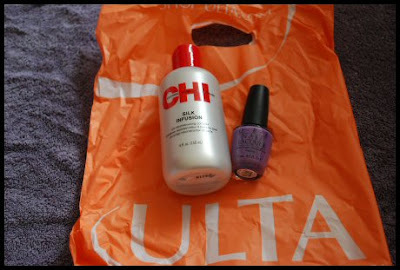 :( To make up for my sadness, I got a big bottle of Chi Silk Infusion and a bottle of OPI's A Grape Fit. It's a beautiful purple! I made a stop at Target, because that store is a drug to me. I got a Sonia Kashuk blending sponge (review is coming! 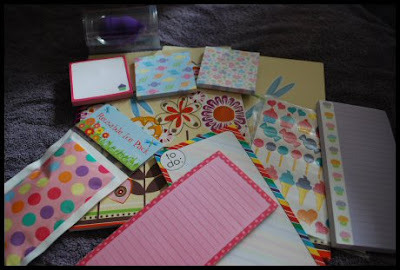 ), 3 pads of post-it notes, 3 memo pads, a sheet of stickers, an ice pack because I have a clumsy husband who always seems to need one, a notebook, and a matching folder. 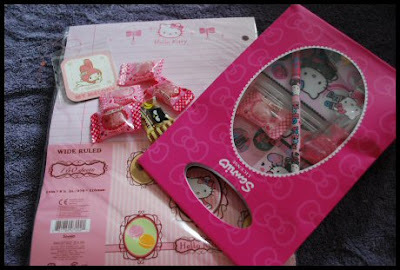 I did get other things, but I doubt you care about snacks, a razor, Hello Kitty bandaids, etc. Ha! So I got the item I wanted most! 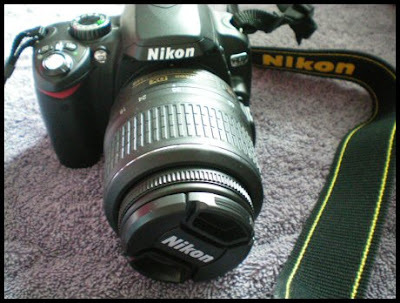 My brand new Nikon D60! It's love, it really is. I've been using it everyday! As much as I would have loved to walk out of the Marc store with a new Faridah on my arm, I did show restraint. :) My last MBMJ tote that I got has been used constantly, so I thought it was time to get a new one. The best part of the blue one is that it has a top zipper! Do you know how hard it was to choose which color of totes to get?! I got the flip-flops for when I go swimming. And then there is the adorable lipstick pen. 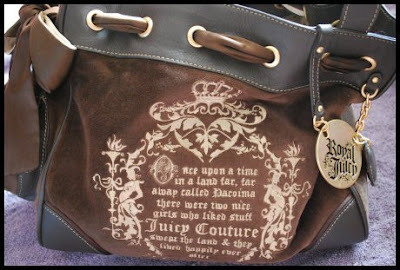 My new (and first) Juicy Couture Daydreamer! It's huge. Not only was it the last one that the store had, but I also got it for a great price. Score! I couldn't go to the Ex. and not get some souvenirs! I plan on wearing the shirt to the movie. I'm waiting to see it in IMAX 3D, so I have to wait until July 29th. I'm dying while waiting, obviously...but it's worth it. 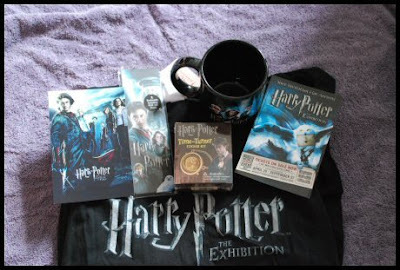 I also got two postcards, two bookmarks with a poster inside, a mug, and a sticker set (which has a sticker book and a Time Turner necklace inside). It's hard to find a Sanrio store these days, especially decent ones. I picked up some little candies, a pack of notebook paper which I specifically got because it has macarons on it, and a gift pack that includes: a notebook, pencil, stickers, and candies. And I got a free magnet! I got these two shirts through the Faith21 line at F21. I will be talking more about these and that fashion line later. 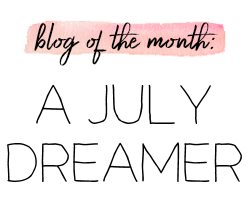 So my fellow plus-size ladies, be on the lookout! 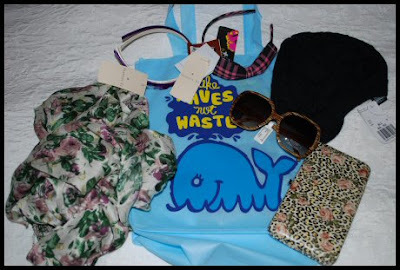 More F21 stuff! 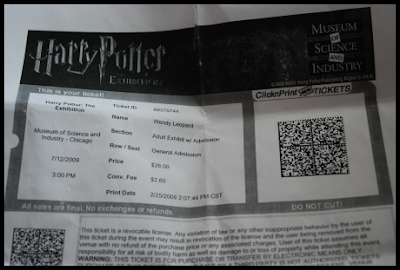 The one I went to was 20x better than the one here in Toronto, in my opinion. They actually had most of what I wanted in stock! 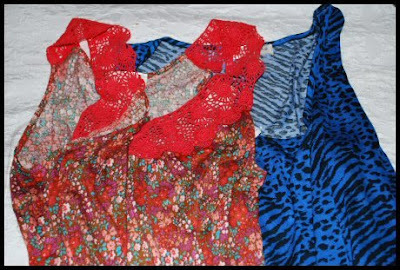 I got a beautiful rose scarf which I'm infatuated with, a whale tote, three bow headbands because I obviously can never have enough bows, a navy blue beret, wood panel sunglasses, and a leopard-rose print wallet. I was looking for a different wallet but I just had to have this one the minute I saw it. I love The Container Store! Last year when I went, I had gotten a lap desk but I used it so much that it was losing it's shape at the bottom. So I got a new one with a gorgeous damask pattern! 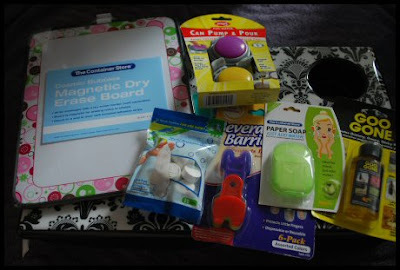 I also got a new dry erase board for my refrigerator, two packages of things for canned drinks (a pump to save the fizz and little clips to help open the tabs), towel tablets that make little towelettes when water is added, apple scented paper soap, and Goo Gone! Ok, I think that is all except for the stuff that I'll be reviewing later! I'm obviously broke now, but it was worth it. More later! And I love the camera! 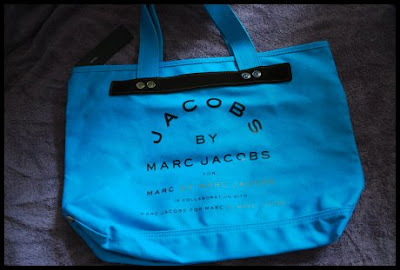 I love the Marc Jacobs totes very much- the colours are fabulous!